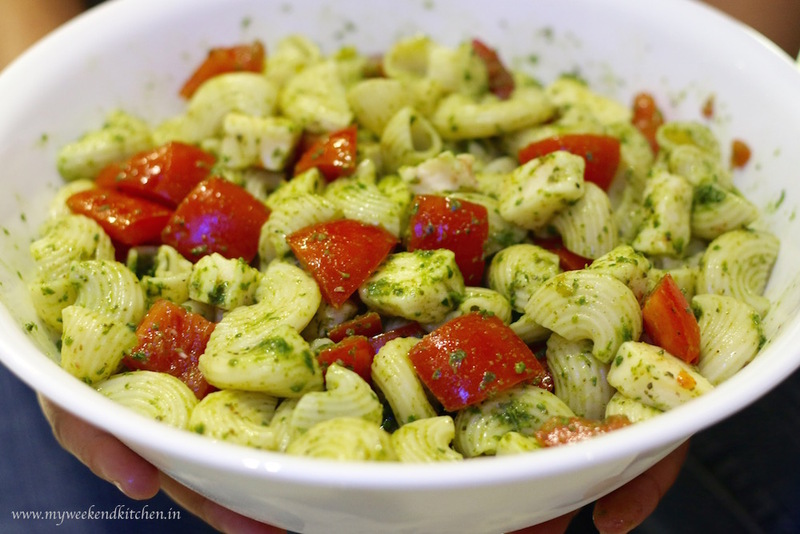 This cold pasta salad recipe is a combination of basic caprese salad and basil vinaigrette recipe with cold pasta thrown into the mix to give it volume and bite. Tomato, mozzarella and basil is no fail combination. 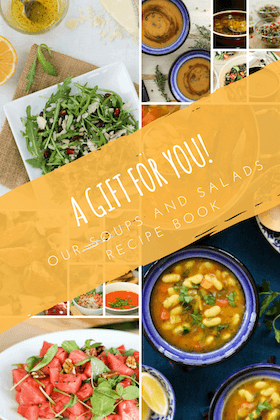 For a recent Barbecue party, I was looking for a new cold salad recipe when I came across the recipe for Caprese salad which is a simple Italian salad made of basil, tomato and mozzarella tossed into a basic olive oil dressing. I had recently also come across a basil vinaigrette recipe and thought of crossing the two recipes for the salad. Cook pasta in 2 litres of salted boiling water for 8-10 minutes until al-dente, stirring occasionally. Drain well and run under cold water. Keep aside. This pasta tastes best cold, if you can, it is better if you can cook the pasta a couple of hours before and chill it in fridge. Loosely tear the basil leaves into your food processor jar. Add in olive oil, vinegar, oregano, salt and pepper. Pulse it to a paste. Deseed the tomatoes and chop them into bite size pieces. You can also use cherry tomatoes in the recipe. Then you just need to half them. In Luanda, we rarely find cherry tomatoes so I usually use the regular salad tomatoes. Chop the mozzarella into similar bite size cubes. In a big salad bowl, toss the cold pasta, tomato and mozzarella chunks with the basil vinaigrette. Taste and adjust the seasoning. For a variation, you can also try mint pesto instead of basil vinaigrette. This recipe is also featured in my weekly column at The Indian Express – Express Recipe: How to make Caprese Pasta Salad.